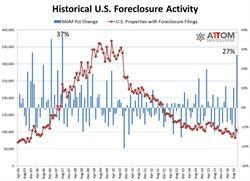 IRVINE, CA--(Marketwired - November 10, 2016) - ATTOM Data Solutions, curator of the nation's largest fused property database, today released its October 2016 U.S. Foreclosure Market Report™, which shows a total of 105,481 U.S. properties with foreclosure filings -- default notices, scheduled auctions or bank repossessions -- in October, up 27 percent from a 129-month low in September but still down 8 percent from a year ago. October marked the 13th consecutive month where U.S. foreclosure activity decreased on a year-over-year basis, but the month-over-month increase in October was the biggest monthly increase since August 2007. Counter to the national trend, 28 states and the District of Columbia posted year-over-year increases in overall foreclosure activity in October, including New York (up 10 percent), Pennsylvania (up 20 percent), Ohio (up 4 percent), Georgia (up 22 percent), Virginia (up 15 percent), Massachusetts (up 11 percent), Arizona (up 17 percent), Indiana (up 3 percent), Wisconsin (up 3 percent), and Colorado (up 64 percent). "While some states are still slogging through the remnants of the last housing crisis, the foreclosure activity increases in states such as Arizona, Colorado and Georgia are more heavily tied to loans originated since 2009 -- after most of the risky lending fueling the last housing boom had stopped," said Daren Blomquist, senior vice president at ATTOM Data Solutions. "The increase in October isn't enough evidence to indicate a new foreclosure crisis emerging in these states, but it certainly demonstrates that this housing recovery is not completely devoid of risk. "The loans used in this housing recovery that appear to be most susceptible to foreclosure are those such as FHA and VA with low down payments," Blomquist added. "Our data shows FHA and VA loans combined represent 49 percent of all active foreclosure inventory for loans originated in the seven years ending in 2015. By comparison, FHA and VA loans only represent 12 percent of all active foreclosure inventory among loans originated in the previous seven-year period, from 2002 to 2008." The report showed a national foreclosure rate of one in every 1,258 U.S. housing units with a foreclosure filing in September. States with the highest foreclosure rates in September were Delaware (one in every 355 housing units with a foreclosure filing); New Jersey (one in every 564 housing units); Maryland (one in every 679 housing units); Illinois (one in every 704 housing units); and South Carolina (one in every 801 housing units). Other states with foreclosure rates ranking among the top 10 highest in September were Nevada (one in every 826 housing units with a foreclosure filing during the month); Florida (one in every 895 housing units); Ohio (one in every 930 housing units); Pennsylvania (one in every 1,018 housing units); and Georgia (one in every 1,028 housing units). "We would expect to see an increase in Florida foreclosure activity in the coming months given the October ruling by the state supreme court there that allows lenders to re-file a foreclosure action against a homeowner in default even if a previous foreclosure case against that homeowner was dismissed and that original foreclosure case was filed more than five years ago, outside the state's statute of limitations for foreclosure," Blomquist noted. A total of 43,352 U.S. properties started the foreclosure process in October, up 25 percent from the previous month, but still down 11 percent from a year ago. October was the 16th consecutive month with a year-over-year decrease in foreclosure starts, but the 25 percent month-to-month increase in October was the biggest month-to-month increase in foreclosure starts since December 2008. Counter to the national trend, 23 states and the District of Columbia posted year-over-year increases in foreclosure starts, including New York (up 15 percent), Ohio (up 34 percent), Virginia (up 15 percent), Arizona (up 48 percent), and Colorado (up 71 percent). A total of 34,288 U.S. properties were repossessed by lenders (REO) in October, up 25 percent from the previous month, but still down 6 percent from a year ago. October was the eighth consecutive month with an annual decrease in REOs, but the monthly increase in October was the biggest monthly increase since July 2015. Counter to the national trend, 22 states and the District of Columbia posted year-over-year increases in REOs in October, including Texas (up 38 percent), Georgia (up 53 percent), Virginia (up 17 percent), Massachusetts (up 104 percent), and Wisconsin (up 45 percent). A total of 43,815 U.S. properties in October were scheduled for a future public foreclosure auction (which in some states are foreclosure starts), up 30 percent from the previous month but still down 6 percent from a year ago. October was the 16th consecutive month with an annual decrease in scheduled foreclosure auctions, but the monthly increase in October was the biggest monthly increase since January 2006. Counter to the national trend, 25 states and the District of Columbia posted year-over-year increases in scheduled foreclosure auctions in October, including New York (up 12 percent), Illinois (up 34 percent), Pennsylvania (up 66 percent), New Jersey (up 6 percent), and Indiana (up 37 percent). Among 216 metropolitan statistical areas with a population of at least 200,000, those with the highest foreclosure rates in October were York-Hanover, Pennsylvania (one in every 274 housing units with a foreclosure filing during the month); Atlantic City, New Jersey (one in every 301 housing units); Rockford, Illinois (one in every 481 housing units); Columbia, South Carolina (one in every 498 housing units); and Trenton, New Jersey (one in every 499 housing units. Other metro areas with foreclosure rates ranking among the top 10 highest in October were Reading, Pennsylvania (one in every 542 housing units with a foreclosure filing during the month); Chicago, Illinois (one in every 571 housing units); Dayton, Ohio (one in every 573 housing units); Philadelphia, Pennsylvania (one in every 597 housing units); and Salisbury, Maryland (one in every 625 housing units). 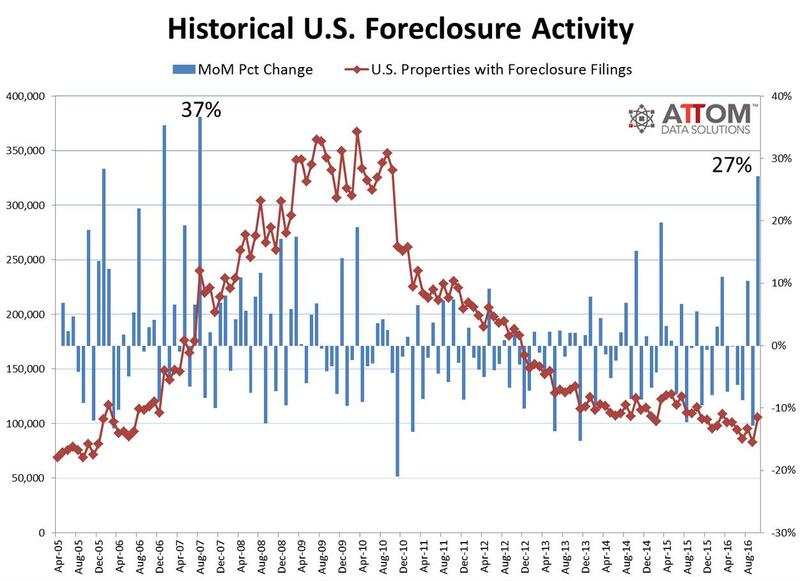 The ATTOM Data Solutions U.S. Foreclosure Market Report provides a count of the total number of properties with at least one foreclosure filing entered into the ATTOM Data Warehouse during the month -- broken out by type of filing. Some foreclosure filings entered into the database during the month may have been recorded in previous months. Data is collected from more than 2,200 counties nationwide, and those counties account for more than 90 percent of the U.S. population. ATTOM's report incorporates documents filed in all three phases of foreclosure: Default - Notice of Default (NOD) and Lis Pendens (LIS); Auction - Notice of Trustee's Sale and Notice of Foreclosure Sale (NTS and NFS); and Real Estate Owned, or REO properties (that have been foreclosed on and repurchased by a bank). The report does not count a property again if it receives the same type of foreclosure filing multiple times within the estimated foreclosure timeframe for the state where the property is located. The ATTOM Data Solutions U.S. Foreclosure Market Report is the result of a proprietary evaluation of information compiled by ATTOM; the report and any of the information in whole or in part can only be quoted, copied, published, re-published, distributed and/or re-distributed or used in any manner if the user specifically references ATTOM Data Solutions as the source for said report and/or any of the information set forth within the report. Investors, businesses and government institutions can contact ATTOM Data Solutions to license bulk foreclosure and neighborhood data or purchase customized reports. For more information please contact our Data Licensing Department at 800.462.5193 or datasales@attomdata.com.